Books are wired and taped, either at the head or at the side and perforated to allow the easy removal of individual sheets from the book. By keeping one copy of each set un-perforated you can easily retain your copy within the book and the remaining copies will be perforated for removal and distribution. 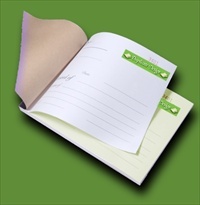 Clients generally buy books if they have more than two carbon copies in each set and would like to retain a copy in the book for their easy reference. Each book contains 50 individual sets and has a board back and a wrap over writing shield. Books can also be drilled with holes down the side for ease of filing and can be sequentially numbered if you would like them to be. Pads are glued at the head and all of the sections will be removed from the pad as and when they are used. 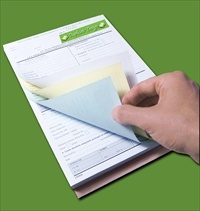 This option is cheaper than having your sets bound in a book and is generally used by clients who have a limited number of parts to their sets and retain their own copy in a separate filing system. Each pad contains 50 individual sets and has a board back and a wrap over writing shield. Pads can also be drilled with holes down the side for ease of filing and can be sequentially numbered if you would like them to be. 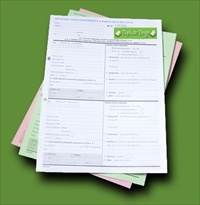 Some clients prefer their duplicate forms to be seperated into individual pages which are glued at the head and not bound into pads or books. Clients usually order individual sets if they would initially like a small amount. They may be setting up new business, trialling new stock items or testing a new artwork design. Some clients simply don’t use many sets and therefore don’t require pads or books. Sets can also be drilled with holes down the side for ease of filing and can be sequentially numbered if you would like them to be. If you are unsure as to what binding you would prefer then please do not hesitate to call us and we will be happy to talk through the different options with you.